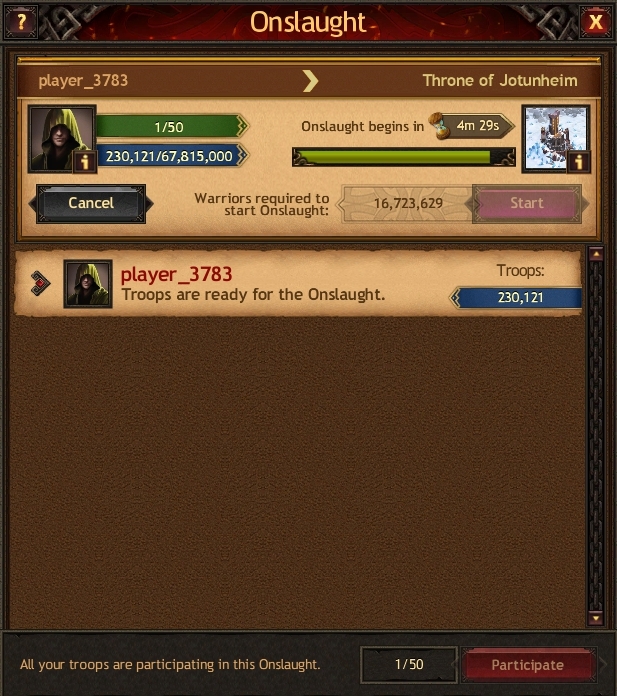 For the duration of the legendary Competition, you have access to the Jotunheim Chat where all Jarls who are currently in Jotunheim can have conversations. In this world, you can form Onslaughts and take part in them as usual. Note that there can be no more than 50 reinforcements in the Throne of Jotunheim and the Place of Power. You cannot be in the Forest of Rocks with an active Peace Treaty item. You also cannot relocate to this territory with an active Shield. All points earned in Jotunheim count towards the Competitions that take place exclusively in Jotunheim. If you relocate to Jotunheim and are inactive (offline or online) for more than 8 hours, your Town automatically returns to the home Kingdom.